This is pudding is the perfect option when you need a quick and filling breakfast. 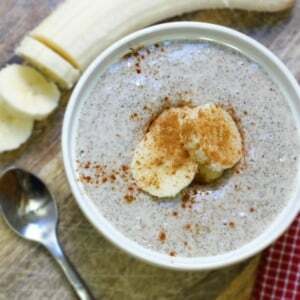 Featuring nutrient-rich chia seeds, this creamy porridge is loaded with fiber, anti-oxidants and omega-3 fatty acids. It’s a definite upgrade from traditional breakfast cereals! Ounce for ounce, chia seeds contain more omega-3 fatty acids than salmon! These essential fatty acids support heart health, regulate blood sugar, and promote healthy hair, skin and nails. An ounce of chia seeds also contains 18% of your daily calcium needs, which is three times more than skim milk! Chia pudding recipes often call for soaking the seeds whole, resulting in a tapioca-like texture, but I prefer to blend it all together for a more uniform, creamy porridge. It reminds me of my childhood favorite, Cream of Wheat! Feel free to make a large batch of this pudding over the weekend, then divide it into individual containers to keep in the fridge, for a quick grab-and-go breakfast all week long. Top with a sliced banana for a delicious and filling meal, that’s properly combined, to boot! Serve with a sliced banana and a dash of cinnamon, if desired. 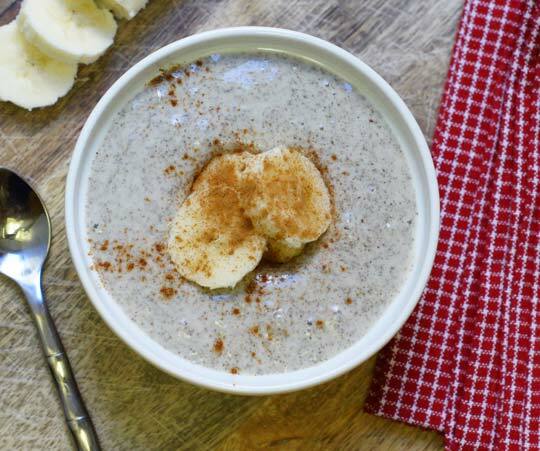 A creamy breakfast porridge that's loaded with fiber and nutrition! If you prefer a tapioca-like texture, simply stir all of the ingredients together and allow to chill overnight. Chia puddings take practice to get the texture "just right," so feel free to adjust the amount of seeds or liquid to achieve the texture you desire. A note on chia seeds: I’ve made this porridge with a variety of chia seed brands, but I recommend sticking to organic varieties for best quality! (Trader Joe’s new chia seeds are not labeled as organic, and they taste bitter to me.) Nativas Naturals is a trusted brand, and Whole Foods also carries a 365 brand that I enjoy. Also, be sure to check with your doctor before regularly adding chia seeds to your diet if you are on any blood sugar or blood pressure regulating medication–> chia seeds naturally help regulate both, and may make your medications too powerful, so your doctor may want to reduce your dosage. Reader Feedback: Have you tried chia pudding before? Any favorite flavor combos? I have just tried this and it was delicious! I was out of vanilla so I only made it with homemade hazelnut milk (yum! ), chia seeds and maple syrup, I blended it but not long enough to have the creamy texture, just a smoother tapioca texture and it was great! It took me 2 breakfasts to eat the whole thing though… It really is filling! I just tried making this and it was really filling! The only think that I would change if I did it again is, I would put less vanilla because I thought it was overpowering. I also made it with matcha tea powder and it was SOOOO delicious. thanks for the ideas! We love this stuff! My toddler does too. I found dark chocolate coco and add it too sometimes. Would honey work as well? I don’t buy maple syrup, I know it’s not vegan, but that’s okay for me! Love this recipe! I usually soak a tbsp of chia and 1/2 a cup of oatmeal in 1 cup almond milk, very yummy but this is such a nice change and so much sweeter! Yum! This is amazing! Loved it so much, so awesome that it tastes like cream of wheat. Warmed up with the Banana sliced ontop was perfection! One of the most enjoyable breakfasts i’ve had in a while! Thanks! This recipe is so amazing. I love the creamy texture and not to mention super quick and easy to prepare. I would suggest either using vanilla beans or making it with 1/4 tsp of vanilla. The alcohol and vanilla taste was WAY too strong for me with 1 tsp, which was annoying because I didn’t really have enough chia seeds to dilute the recipe down. What is the average serving a day of chia seeds? I’m not sure if there’s an average daily serving, but this pudding is probably the most I’d eat in a day. I had this over the weekend (without the maple syrup), and it was delicious and filling! Thanks! this recipe is fantastic. my husband wouldnt try it because it scared him… anything healthy scares him… so i made it again but doubling the amount of almond milk and vanilla and syrup, the texture was still very thick but less goopy so my husband tried it and liked it! wow! Anyone try this with coconut milk? My family has almond allergies. I bet that will be delicious, too! I used half almond milk and half coconut milk (full fat non-bpa can, not the watered don carton stuff) once. It tasted amazing!! I loved this recipe! Do you eat the whole batch or do you proportion it out? It seemed to make a lot! I was also wondering what the calorie count was? I know chia seeds are pretty high in calories. I also wanted to add that I made mine with rice milk because it was all I had and it was great also! I eat the whole batch, and yes, it is filling! I don’t count calories, but I’m sure you could use a free website to figure it out. Cannot believe these comments.What planet are you all on? This was the most disgusting thing I have ever tasted a good dollop of mustard well mixed in might hide the taste! Sounds like you got a bad bag of chia seeds! I recently got a bad batch from Trader Joe’s myself, and if had I never tried chia seeds before, I would have thought they were the most disgusting thing ever. Chia seeds shouldn’t have much of a flavor, so if yours do, it’s a bad batch. My 2 year old wanted to try it and she wanted her own bowl. It was delicious! Thank you! wow that looked so appetizing ! I’m gonna try this one for sure ! I didn’t know chia seeds, when soaked overnight, will become like fish egg or tapioca texture ??? if thats the case.. OMG it will make me so happy ! I never know which ones to use…the “bigger”-looking ones or the “smaller”-looking ones? Maybe these smaller ones are “shelled”? Which ones do you (and most bloggers) call for in chia seed puddings? What are the bigger/shelled ones used for? I love chia any way I can get it! So versatile! I introduced chia seeds to my sister and her family recently and her kids think they are sprinkles and devour them! What a fabulous transition they’re experiencing! This looks amazing and I will try it with Stevia. When eating it as a breakfast porridge, so you eat it warm? No, I eat it at room-temperature, straight from the blender. But I’m sure it would be delicious warmed up a little, too! There are only one size chia seeds. They expand when you allow them to sit in the liquid. I’m trying to follow an anti-candida diet so can I leave out the maple syrup or will it make it taste different? it WILL taste different in that it won’t be sweet. if you’re on an anti-candida diet and don’t mind a non-sweet pudding – leave it out; otherwise, try stevia. stevia is safe in anti-candida diets. I am on a Candida Diet also…I just saw this recipe yesterday and I’m gonna substitute the maple syrup with vegetable glycerin. If you have a good blender, putting a couple of dates in the milk and blending smooth and then adding the chia to blend again would sweeten the pudding as well. Anyone have a solution for pure vanilla extract without alcohol?? I find I can detect the alcohol in any recipes that are not baked. The only product I found, without alcohol, is at Whole Foods. It’s Frontier’s all natural, alcohol-free vanilla “flavor.” I want pure vanilla, not vanilla flavor. The ingredients, however, include glycerin, fair trade certified vanilla bean extractives & water. Maybe you could try using real vanilla beans? As I understand it, all “extracts” have alcohol in them, so to have an alcohol-free version, it will be labeled as “flavoring” instead. You are so right about chia pudding taking practice…I feel like it’s never the same twice! I’ve definitely found giving it a whirl in the food processor achieves the texture I prefer, so I’ll give it the extra step and clean up. Still easier than cooking oats, and it’s a great breakfast when it’s warmer out too! Now if someone could up with an idea for a healthy Malt-o’-Meal riff!! I miss Cream of Wheat…but I REALLY miss the malt-y kick….any suggestions anyone? I dont have almond milk on hand so i substituted with soy milk. It’s in the fridge. Can’t wait for breakfast tomorrow! I went a bit crazy for chia puddings a few months ago… I came up with several flavours I loved! Matcha chia pudding, I also added shredded coconut to this. Made one with coffee and cocao aka mocha chia pudding. Strawberry pudding. Peanutbutter and banana. Plain banana (blend the fruit when making pudding in blender.) the list goes on! It’s so versatile! Wow, those flavors sound yummy! I am going to have experiment! Since you first mentioned this pudding in one of your posts I have made it twice, & loved it! I leave it in the oven for 30 minutes with the door open, on the lowest setting & it makes a perfect “cream of wheat” warming treat! This looks excellent! I’ve been obsessed with making pudding with agar agar, but I’ll have to alternate with this one! I make a chocoloate version of this using cacao powder. It’s super tasty. I’ve never tried blending the seeds, but now really want to try that next time! By the way, I use homemade, non-strained almond milk for mine. However, non-strained almond milk is really thick and makes a thicker pudding. Does your recipe/proportions assume a thin almond milk? Yes, I always strain my almond milk, so this recipe assumes you’re using store-bought or strained homemade almond milk. HMM! I am going to try this. Never done a true chia pudding before since I hate the tapioca texture – but my VitaMix would fix this sure! I’ve never tried chia seeds before, they’ve always intimidated me..but this makes me want to finally give them a try! Love this! I hate making breakfast in the morning so this would be a great grab and go option for me! I’ll have to try it out!